There was a desire to make a VTR that was cheaper than the Quad and offered additional features like picture in shuttle, slo-mo and freeze frame. 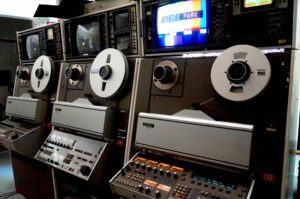 Many different tape formats were tried but all lacked the broadcast quality that was needed. 1″ Type “C” fit the bill. Excellent quality, long head life, much cheaper than the Quadruplex and it had the stunt features required. Our VPR-3s originally cost $100,000 each. These contain the Zeus Video Processor that improved picture quality and made dropouts invisible. Many call this model the finest 1″ VTR ever made. With the air guides, your tape floats on air, reducing friction and lessens any damage to your masters.